The Venetian Masquerade requires formal, beautiful attire, completed with a Venetian Masque. After all, Valentine’s day is about romance, love & beauty. We will provide you with a 4 Course Venetian Feast at R425 pp. Ticket INCLUDES a TRIO performing beautiful live music. You might think you are on the St Marcus Square in Venice! A prize awaits the best dressed couple! 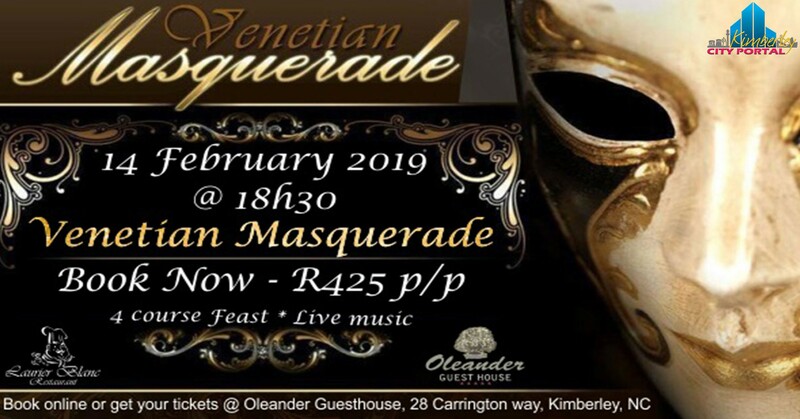 Book Online now or Buy your tickets at Oleander Guesthouse, Kimberley.